This video (taken from the Win/Fail Physics collection) is the beginning and the end of a mini learning cycle during my projectile motion unit. At the beginning of the unit, it’s the hook. At the end of the unit, it’s the assessment. The kids now have a need to know. They want to know if the video is real or not, but they lack the tools and knowledge to support or refute their original claim. They are now willing to go down the rabbit hole with you. Whenever possible, I frame my lessons around the Karplus learning cycle: Exploration, Invention, and Application. (It’s nothing special. In fact, most other learning cycles like 5E, 7E, and Modeling are strikingly similar.) Instead of relying on lectures and textbooks, I use the learning cycle so students can construct the conceptual and mathematical models themselves, all within an interactive learning community. By this point in the year, my students have been through several cycles, including constant velocity motion, accelerated motion (including vertical free-fall motion), and balanced/unbalanced forces. Pirate Treasure Hunt: Each group gets 10 directions (e.g., “Walk 44 tiles north”). What they don’t know is that all the groups have the same 10 directions arranged in different orders. However, if they follow the steps in order, they will be walking through walls and out windows. Eventually, students realize they can combine all the north-south directions and all the east-west directions and simply walk X paces west and Y paces north. The follow-up class discussion about “Why did you do that?” really gets at the independence of horizontal and vertical motion. Dropping/Shooting a Bullet: Student use ice cream cone shooter toys to answer the question: “When released at the same time, which hits the ground first: a horizontally shot bullet or a bullet dropped from the same height?” Predictions and justifications must be made. Some students see the connection right away. Others don’t, but the results make for great discussion afterwards. So, as a class, we decide to split up the data collection. 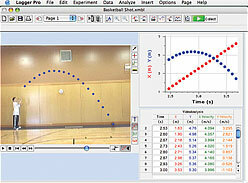 One group will vary ball mass, another toss speed, and another arc shape. We’ll share the position vs. time and velocity vs. time graphs created and look for patterns in their shapes and in their equations. This is whole class inquiry — groups are doing different experiments and everyone’s data is needed. Everyone makes a contribution to our classroom scientific community. All position vs. time graphs are straight lines. The slope of the line represents the horizontal speed, which remains constant during flight. This is like our previous model of constant velocity motion. All velocity vs. time graphs are flat lines. This means the horizontal acceleration is zero which matches up the horizontal position vs. time graph. Again, this is like our previous model of constant velocity motion. All position vs. time graphs are in the shape of upside-down parabolas, with the time-squared coefficient being about 5 m/s/s. This is like our previous model of accelerated motion in free-fall. All velocity vs. time graphs have a slope of about -9.8 m/s/s. Again, this is like our previous model of accelerated motion in free-fall. The mass of the ball doesn’t matter. Again, this is like our previous model of accelerated motion in free-fall. Projectile motion is simply the combination of the constant velocity model (horizontal) and the acceleration motion model (vertical). We are now ready to return to the Kobe Bryant video to apply the student’s newly created model for projectile motion. They decide to immediately feed the video into Logger Pro for analysis. Students are able to make a claim regarding the realness of the video, and justify that claim with evidence and reasoning. I ask them to accumulate as much evidence as possible in order to make a stronger case for their claim. Groups that finish early are pushed further with more questions: Is Kobe’s horizontal speed reasonable? Is the vertical and horizonatal distances he leaps reasonable? How will you figure those out and make a claim to their possibility? At the end, groups whiteboard their work again, groups present their results to the class, and we reach a class concensus. The debate here sometimes gets very heated. College Teaching and the Development of Reasoning (2007) — Applicable to all content areas and to all age groups where students are transitioning from concrete to formal reasoning (high school and middle school included). If you only read one module, it should be: Module 10 – Teaching Goals and Strategies. Physics Teaching and the Development of Reasoning (1975) — This was the foundation for “College Teaching” above. Still relevant and highly recommended! 2. If you don’t have Flipcams, a regular digital camera that shoots movies will do fine. And if you don’t have a digital camera, there are plenty of pre-fab projectile videos to use — have a look at Dolores Gende’s collection of physics videos for analysis. 3. Levels of Inquiry. This cycle has elements of both guided (Level 2) and open (Level 3) inquiry. I stay away from confirmation/verification (Level 0) at all costs. 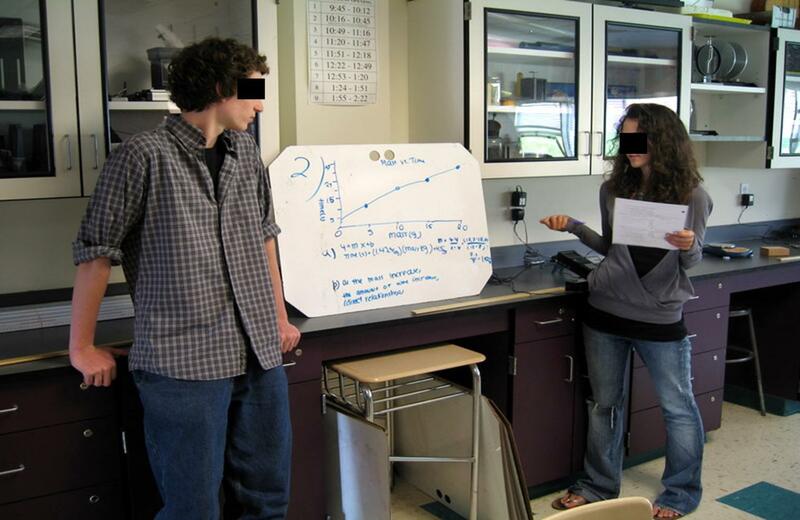 The coupled-inquiry cycle is an easy way to do more open inquiry in class. 5. Rhett Allain’s wonderful analysis of the Kobe Bryant video was the inspiration for this learning cycle. Thanks, Rhett!